The legendary old-school band Def Leppard recently announced their plans for 2019. The rockers are slated to embark on a grand tour across Canada and Europe. In fact, Def Leppard will bring Tesla band with them on the trek. 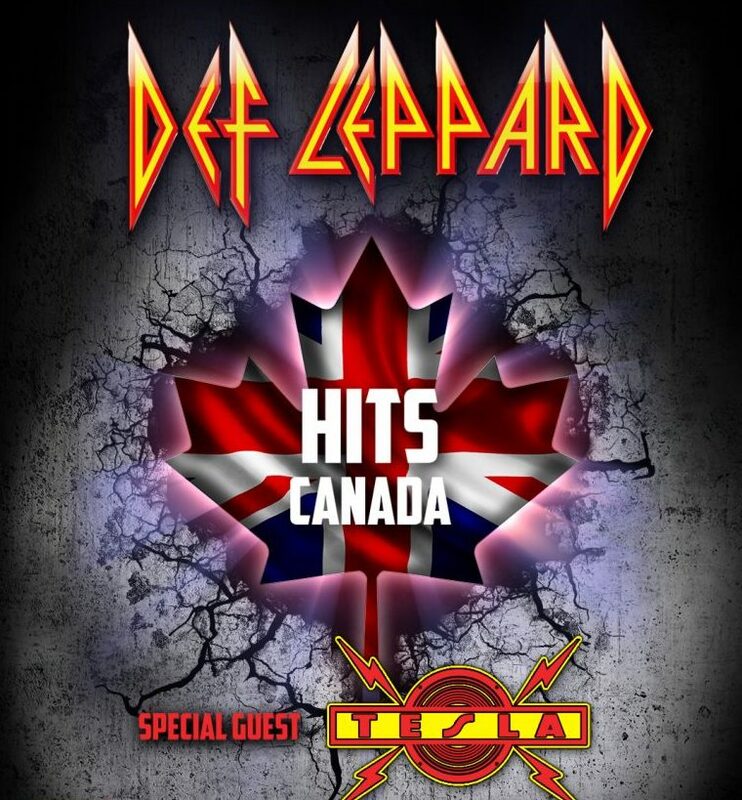 Def Leppard refuse to rest on the peak of their glory and set up a new milestone for 2019 by going on 11-date tour across Canada. Fellow rock band Tesla were invited as a supporting act with the tour scheduled to kick off in Halifax on July 11. The rounding concert is to be played in Calgary on July 31. After 15 years of eligibility, the British the quintet of heavy-metal pioneers will celebrate their induction into the Rock & Roll Hall of Fame (2019 Performer Category) this March. It been a much anticipated event since 2004 when the band got eligible for inclusion. Finally, Def Leppard earned their seat by winning the hearts of Rock & Roll Hall of Fame online community voting for the them. Last year’s co-headlining stadium tour in North America allowed Def Leppard to hit a historical mark of 1,000,000 tickets sold while the concert run made over $100 million. Def Leppard and Tesla continue their touring ways as the letter band has a successful history of opening the shows of the British icons. Tickets go on general sale at 10AM on Jan. 18 with a fan club pre-sale starting at 10AM local time on Jan. 11. Def Leppard previously announced a European festival tour from June 6 to July 5. The Def Leppard European Tour 2019 will commence on June 6, 2019 in Sweden at the Sweden Rock Festival in Solvesborg. It is expected that Bon Jovi will also be featuring on the Sonderborg, Düsseldorf and Munich concerts and Whitesnake will perform at Milan show. Check out the full list of 2019 tour dates below. "Can you feel it? Do you believe it? ", says the official video trailer. The co-joint tour of Def Leppard and Journey promises to shake the rock scene once again as it did back in 2006 when the British were hitting the road in support of the Yeah! album. Def Leppard and Journey will share the bill on the equal basis with the co-joint North American tour kicking off late in May and will last until October. As for the schedule details, Def Leppard and Journey start their tour in Hartford on May 21 and play the last show in Los Angeles on October 6th. If you are interested in visiting one of the tour dates, check out the full schedule below. Chances are pretty high that Def Leppard and Journey will be playing near you in 2019 because 58 cities is a serious number of concerts! Book your Def Leppard tickets NOW! There was also a sweet topper for Def Leppard fans in the UK. It was a long wait but almost after three years, Def Leppard would be touring across the UK and Ireland. Def Leppard came back to their home country in December 2018 with the G3 tour. The British rockers unveiled the setlist saying they would play the whole Hysteria album that gained them a huge success and popularity. The band’s frontman and unchanging lead vocalist, Joe Elliott, said about the enormous efforts that the Def Leppard have set for the upcoming tour, and therefore promised the show to be one of their greatest tours ever since the release of the legendary ‘Hysteria’ album in 1987. By the way, in August 2017, the musicians had celebrated the 30th anniversary of the ‘Hysteria’ LP and had released a collectors edition box as well as remastered hits on vinyl. Musicians are currently actively involved in the preparation of the tour’s venues, scenes, and so on. Joe Elliott jokes about preparation for the concert "We're gonna head off down to the Lego store and by some bricks and pieces. Try and lay everything out and make a model." During the tour, there will be at least 10 performances at the most famous and biggest stadiums in North America. In addition, all fan-favorites songs like 'Pour Some Sugar On Me', 'Dangerous', 'Let's Go', and 'Love Bites' will be on band’s setlist, but the main focus will be on the ‘Hysteria’ album. The brand-new tour, which will take place from May clean to September 2018, will be closed by half of the Def Leppard’ performances, and with the other half of the Journey’, as the Joe noted himself ‘’We will take in turns to close the show out." The English band Def Leppard, originally spelled as Deaf Leopard but later modified to deny direct analogy with Led Zeppelin, is one of the best-selling labels in the world while their two albums Pyromania and Hysteria were granted RIAA Diamond certification. Withholding the same line-up for 23 years so far, Def Leppard band comprises five members with the likes of Joe Elliott (frontman), Rick Allen (drums, percussion), Phil Collen (guitar, backing vocals), Vivian Campbell (guitar, backing vocals) and Rick Savage (bass guitar, backing vocals). Def Leppard has never tolerated any kind of interference into their creative work enjoying the privilege to do music and songs that reflect their nature.